Pantone have just announced their colour of 2019 and it’s….. Living Coral?!? Immediately it conjures up bridesmaid dresses, all twee and meringue like or a nail varnish that gets left unused in your make up bag. Anyone remember 2018’s colour of the year? Nope? I certainly do as I remember recoiling back in horror when it was announced. Purple? In decor? Never. Not on your Nelly! Ultra Violet it seemed would be appearing in all our homes, as Pantone explained “it’s truly a reflection of what is needed in our world today”. Not in my world thank you very much! So, who are Pantone? It began as a commercial printing company in the 1950s in New York and Pantone came into being when its founder, Lawrence Herbert created a system for identifying and matching colours for the print and textile design industries. It is Pantone’s Color Institute that makes the predictions of what colour we will be seeing everywhere in the coming year and is often controversial. But let’s face it, as the old adage says, there’s no such thing as bad publicity (except your own obituary) and the cynic in me often wonders if they try to go for outrageous colours to make headlines. Who wants to write about Magnolia? Are you like me and take about 6 months to choose a shade of white? I like the colour Coral, I feel it doesn’t take itself too seriously and it reminds me of summer; bikinis, Tequila Sunrises and those over filtered Instagram travel accounts. Is it a Red? Orange? Peach? It sits quite nicely in between all three, not as subdued as Peach but not as shouty as Orange. It’s a great summer colour for the fashion world and celebrities worldwide, it seems, are already embracing the trend. Personally, I can’t wear the colour. It makes me look like a pig in a blanket! So, it got me thinking, how would you implement Coral into home decor? I think Living Coral is too strong to go for a sofa or large piece of furniture in this colour, but I think it is perfect to add a bit of brightness and character to a room when we’ve spent the Winter months honing our inner Scandi monochrome look. You wouldn’t be able to paint the whole room, four walls of this colour and after a few minutes it would feel like an orange had swallowed you whole. Here are a few of my favourite coral home-wares out there. 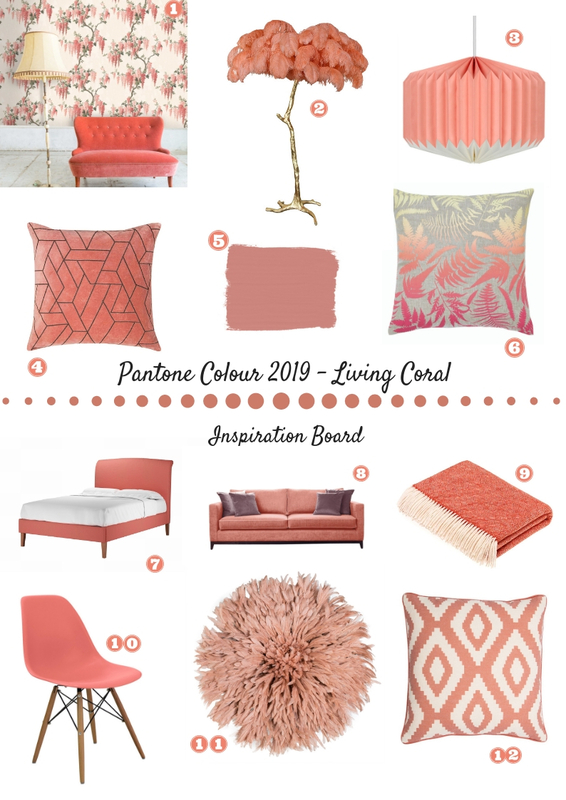 With some of these products in mind, I created a mood board for a Living Coral inspired living room. As coral is such a bright and edgy colour, I would keep the rest of the room quite calm and natural. Think off white walls (perhaps Little Greene Holly Hock) with cream carpets or an oversized rug with stripped back wooden floors. 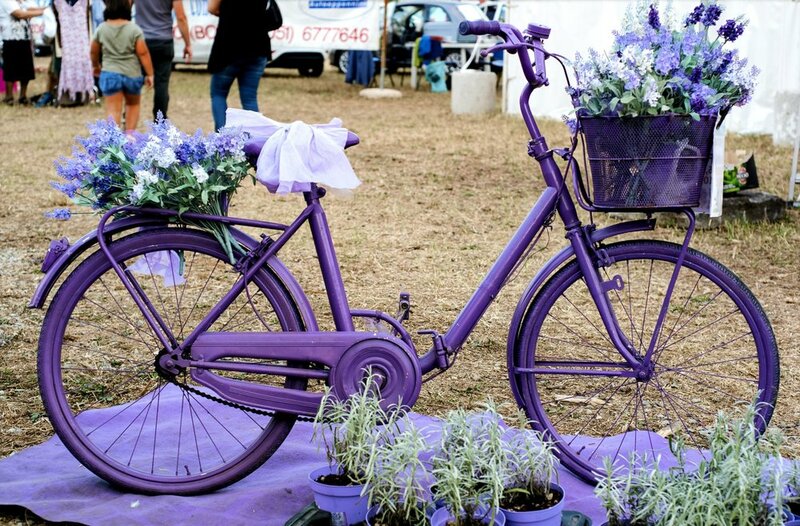 I also think this is a beautiful colour when matched with wicker or rattan pieces which is perfect for the upcoming Spring/Summer season and can easily brighten up your garden. The colour Coral has been on my spectrum for a while now, I have cushions and throws in this colour dotted about the house and although I am definitely partial to a bit of blue and green, I love how this colour injects a bit of summer into a space. There are also a few other homes out there that love to use the colour Coral and here are a few of my favourites. I could definitely get on board with Living Coral, much more so than Ultra Violet. I think it is easy to incorporate it into your home and hopefully we will see it more throughout 2019. How will you add it to your home?